Every now and then new music appears from the individual members of ABBA. Agnetha Fältskog is, of course, one-quarter of the enormously successful Swedish pop group. As a lifelong fan, of both ABBA and Fältskog’s solo efforts, I immediately ordered the vinyl release and while I love the album as a creative piece of work between Fältskog and her collaborators Jörgen Elofsson and Peter Nordahl, the vinyl release is a little disappointing. From the get-go, I was surprised the cover art was so out of focus. Yes, it is captured softly to separate Fältskog from the album typography and while it may look glorious on streaming services and CD-sized canvases, the larger vinyl reproduction makes me wonder if I’m slowly going blind. One would have thought, or at least hoped, that this would have been taken into consideration, but sadly it wasn’t. While the mastering is solid, the pressing is questionable. Pressed by GZ vinyl, there are a number of scuffs from the manufacturing process that create a few additional pops and clicks. Yes, vinyl is fundamentally a fragile medium, but if records are cared for, as mine are, they can be appreciated without pops and clicks destroying or impacting the listening experience. Nevertheless, when the pops and clicks aren’t audible, the vinyl reproduction is sonically beautiful. The One Who Loves You Now is a lovely song to commence the album with, although I’d like to hear a version with a slightly slower tempo as I feel it would have further amplified an already exceptional song. When You Really Loved Someone really comes into its own when the chorus begins. That said, this song borders on campy pop music and Fältskog’s vocal sounds a little overproduced and processed on this song. It isn't necessarily bad but it makes me think of numerous modern pop stars and therefore I question if the vocal presentation really suits Fältskog’s capabilities. Regardless, When You Really Loved Someone is an exceptionally enjoyable song. Perfume In The Breeze has a great tempo. You'll be toe-tapping and head-bopping in no time. Although, again, I feel it is overproduced, especially in the vocal region of the chorus. It just sounds as though it’s following a modern pop music formula. As with the other songs, however, I do thoroughly enjoy Perfume In The Breeze. I Was A Flower is absolutely stunning. It’s one of the greatest songs Fältskog has ever recorded, if not the greatest. You'll want to turn the volume up and become absorbed by the soundstage as it wraps around you as the speakers disappear, leaving you, Fältskog, and the instrumental orchestral movements to exist in that special place where music and ecstasy intersect. Amazing! I Should've Followed You Home is the perfect song to follow I Was A Flower. It’s a recording and mixing marvel as the vocals were recorded in two different studios. Yes, this has been done before, but each studio has a unique sound, yet the vocals are merged superbly. The decision to have Gary Barlow duet with Fältskog was superb as his vocal tonality compliments Fältskog’s perfectly. That all said, it would have been interesting to hear the difference had both artists been recording in the studio, at the same time, in a linear manner. I have a sneaking suspicion the song would have been even stronger, but I’m far from disappointed with the song we have as it’s superb. Past Forever is beautiful. I really love Fältskog’s vocal on this track as it sounds largely untouched and natural. Her soaring vocal is a pleasure to listen to and I could put this song on repeat for hours. Actually, I’d like to see this song re-recorded as a duet with Celine Dion. All the sonic cues are there to suggest such a collaboration would be nothing short of pure perfection. Dance Your Pain Away is a disco-based track that is significantly different to the past few songs and while auto-tune is clearly used here, it's a great dance track that has a modern sound and one which DJs would have a field day incorporating into their live sets. If you want to hear additional remixes, check out the remixes EP on TIDAL Hi-Fi or Apple Music. Bubble is a lovely vocal-based track. I absolutely adore it! Back On Your Radio is campy. Okay, it isn't that bad. No, wait, there's the chorus again. It just isn't good and should never have been recorded, let alone released. Harsh, yes, but this is a song for an artist aiming for a younger audience, arguably an audience that Fältskog wasn’t focusing on as it sounds out-of-place with the rest of the album. I Keep Them On The Floor Beside My Bed is the only song on A to be penned by Fältskog and is absolutely beautiful. As the final song on the album, it closes it perfectly and encourages me to listen again and stay within Fältskog’s back catalogue. Overall, A is a thoroughly enjoyable album that should be in every fan’s collection. A is available on Vinyl, CD, the TIDAL Store (16/44.1kHz FLAC), and iTunes (Mastered for iTunes). If you prefer streaming, A is available on TIDAL Hi-Fi and Apple Music. Click here to read other Agnetha Fältskog reviews by Subjective Sounds. 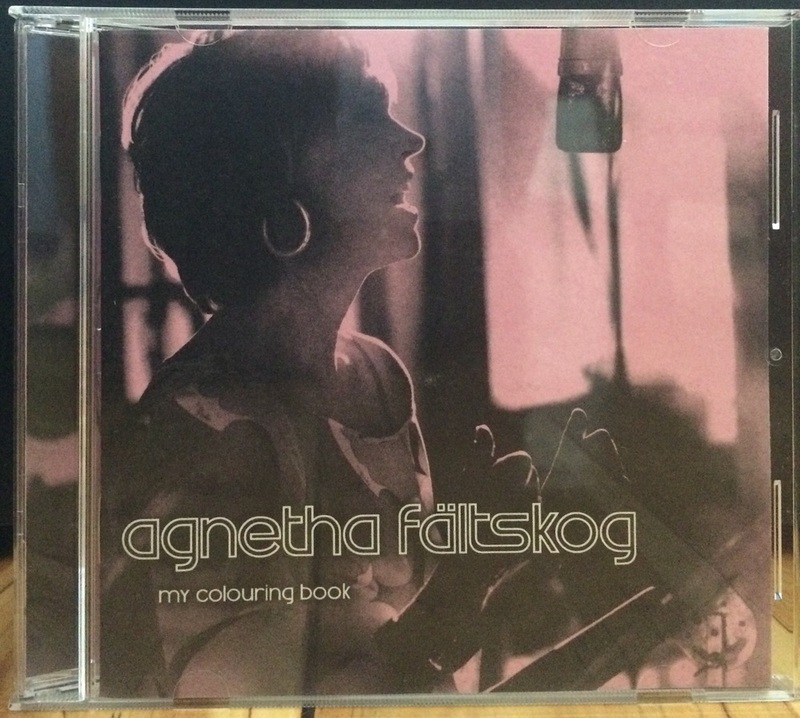 My Colouring Book is Agnetha’s homage to the music that subjectively held a very special place in her heart. While the album lacks any original content, Agnetha takes a series of classics and makes them her own. Agnetha is one of the greatest female vocalists of our time. While this album was almost two decades in the making, with A following nine years later in 2013, Agnetha’s recordings are certainly worth with the wait for any fan. Her solo work is not merely an attempt to rekindle the style and success she had with Abba, but that is also a good thing as I dare say that her vocal capabilities were often wasted in Abba. Personally, I place Agnetha in the same category of vocal performer as Barbra Streisand, Celine Dion, Adele, and Karen Carpenter. Capable, restrained, and soothing comes to mind when I consider all these exceptional performers. Agnetha brings those same qualities to My Colouring Book. Sonically, this is one of the most beautiful albums in my collection. It has been mastered perfectly within the limitations of the compact disc format. Mastering Engineer Christopher Stannow, from Cosmos Mastering, should be congratulated on a job well done, especially during a period of time where loudness took priority over an energetic dynamic range. The edition of the album that I own is the WEA European release – cat no: 5050467-3122-2-7. Besides the incredible sonic performance of this release, the liner notes are presented on high-quality non-glossy paper stock that has a texture akin to artistic paper. This linking of the tactile experience to the album name is just a small, but very important, aspect of album experience. No matter how good streaming becomes, it will always deliver less of the artist’s vision than the physical product. The overall design is beautifully presented in a series of pastels with all song lyrics presented throughout. As you know, I’m not a big advocate of lyrical meaning, but I do appreciate that this information is included. Similarly, there is a lovely short letter, penned by Agnetha, that details the concept behind the album. I truly wish more artists would include a section like this, rather than a thank you to everyone they’ve ever known. My Colouring Book is a beautifully atmospheric song with exceptional acoustic elements that intertwine with Agnetha’s vocals and amplifies her presence. It is a perfect song to commence the album with as it sets the tone for the songs that are to come. My Colouring Book has been recorded by a number of well known artists including Barbra Streisand, Andy Williams, Dusty Springfield, and Aretha Franklin to name a few. Agnetha’s version is certainly on par with these before mentioned artists. When You Walk In The Room begins with some lovely classical elements before proceeding into a pop rendition of the song that is Abba-esque, due to the music styling and vocal presentation. This song was originally written and recorded by Jackie DeShannon and additionally covered by The Searchers, Bruce Springsteen, and Status Quo amongst others. If I Thought You'd Ever Change Your Mind was originally recorded by Cillia Black, but Agnetha takes this song to a whole new level while remaining true to the original. This song also served as the first single from My Colouring Book. A music video with Agnetha performing the song, in a studio setting, was also produced for the single release. Sealed With A Kiss, first recorded by The Four Voices has been covered numerous times, but I will always associate this song with Jason Donovan. That’s because it is the version I remember from my own childhood. That doesn’t mean it is a good association. Agnetha easily outperforms Donovan’s rendition, and that performed by The Four Voices, as it was a perfect song to match her vocal delivery style. Love Me With All Of Your Heart is simply a beautiful song. Agnetha has once again selected a song and made it her own. What an exceptional talent! Fly Me To The Moon is Frank’s song. Nobody does it better. Sinatra simply nailed it and while there have been exceptional renditions of this song from some of the world’s greatest jazz vocalists, I will always associate this song with Sinatra. That isn’t to say that Agnetha’s rendition is subpar, anything but. She performs the song beautifully and has the smoothness in vocal range to truly do the song justice. She has also recorded it at a slower pace, thereby creating a little more of a relaxed atmosphere when compared to Sinatra’s upbeat version. Past, Present And Future is simply gorgeous. I love the spoken word lyrical delivery that intertwines with piano and string instruments. A Fool Am I is a song that I play LOUD. The symphonic instrumentation and Agnetha’s vocals are exceptional. When you listen to it, close your eyes and the song will transport you to the stage where you can live vicariously. In that moment you are not you, yet you are not truly Agnetha. You are but a figment of your imagination as you sing at the top of your lungs before a loving audience. Yes, I am a dreamer, but that is why I love music. It gives so much, yet expects so little in return. I Can’t Reach Your Heart is a lovely song that works well with the flow of the album. Sometimes When I’m Dreaming was originally recorded by the great Art Garfunkel. Agnetha’s vocal reach on this song is second-to-none. When I hear her sing, like she does on this song, I know her talent was wasted with Abba. The End Of The World is a fantastic song, but I associate it strongly with The Carpenters. While Agnetha performs the song gallantly, I just don’t feel she delivered an exceptional performance. Remember Me is lovely, until the beginning of the chorus. I find Agnetha’s vocals come across rather shrill and are not as polished as that found on the rest of the album. It is a minor disappointment in an otherwise exceptional album. What Now My Love is a fantastic song to close the album on. I love the drum beat used throughout this rendition and the overall musical accompaniment gives the song a unique soft rock edge. It has been covered extensively but Agentha’s rendition is certainly on par, albeit different, with Shirley Bassey’s exceptional recording. This album is a must have for any collection. If you’re a fan of Abba, you’ll love it. If you’re a fan of easy listening or jazz music you will thoroughly enjoy it. In-fact, the only people that may not like it are those who dislike Abba, the song selection, or those who are very genre specific. Without a doubt, My Colouring Book is one of my most prized possessions. I only wish it was released on vinyl, but as I mentioned earlier the sonic quality of this CD is extraordinary and the packaging proves that the humble CD can be produced to the highest of standards. My Colouring Book is available on CD and TIDAL Hi-Fi.